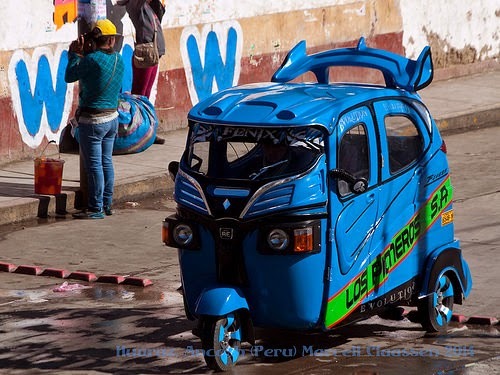 Travelling around Peru can be a big expense due to long distances as well bus and taxi prices. Short trips will generally be more expensive than the longer (sometimes even much longer and further) journeys. I always keep track of what I’m paying for my transport and then also, note when I depart and arrive. Those of you who’ve met me will know I am always carrying a little notebook with me where these things get noted. Keep in mind these prices are from June to October 2014 and only for the bus companies and taxis I travelled with; where I got various quotes I’ll give them as well. Very important to remember is that on and around public holidays all the bus ticket prices go up, as much as $2.00 per ticket on the budget companies. As for exchange rate for the purposes of this post, I’m working on the average during the June - October 2014 period which was Soles (S/) 2.80 for USD ($) 1.00. Early morning on the road between Huaraz and Yungay. Peru's highest mountain "Huascaran" on the the right. > Booked online through Hitchhikers Hostel Lima in Miraflores where I was staying. Lima > Huaraz (June 2014) S/ 50 with Oltursa. > Oltursa is one of the top bus companies with Cruz del Sur, and consequently more expensive. > Booked two days prior in Huaraz and paid only S/ 40 instead of the normal S/ 45. No idea if this ‘discount’ is normal for early bookings. > Perfect example of how going further on a continuous journey is cheaper; Tumbes is 21/2 hours further and the ticket is the same price as this (see next). Lima > Tumbes (Oct 2014) S/ 60 with CIVA (22 hours) Departs Lima at 1pm. > Departs Tumbes at 1am although having said that, the bus only pulled in at the Tumbes depot at 2:30am. I was sleeping at the depot - security guard lets you in when you show the ticket. > from the El Sol bus depot to that of America Express I paid S/ 6 for a moto taxi (10min). > This is a small roadside shop and stalls only although they had no problem with me camping behind the building. I met some truckers here so wasn’t really totally alone, some vigilance overnight might be in order although probably better to avoid having to stop here very late afternoon as there will be no transport till the next morning. Yuracmarca - this is pretty much most of the village. > Here I just took the next bus that went to Chuquicara first thing in the morning. > This was quite expensive as a roadside pickup as the bus from Chimbote to Cabana is S/ 25! > On the way back, I got a ride with a collectivo car into Huaraz and paid S/5 - this was from further up the route to Rajucolta. Feel free to add some more prices in comments and I'll add them to a next post. subject to mobile phone connection and where you are; otherwise just get a taxi on the other side. Only advice more I have is the usual, be wary and pay attention what's happening around you and you'll generally be fine. When it comes to directions, taxi and bus drivers are usually good but there are the odd exceptions when they'll say they don't know - until you tell them to take you there, then they know exactly where it is! !